If you've ever wondered why certain foods taste great together—tomato and basil or, hell, peanut butter and jelly—then wonder no longer. 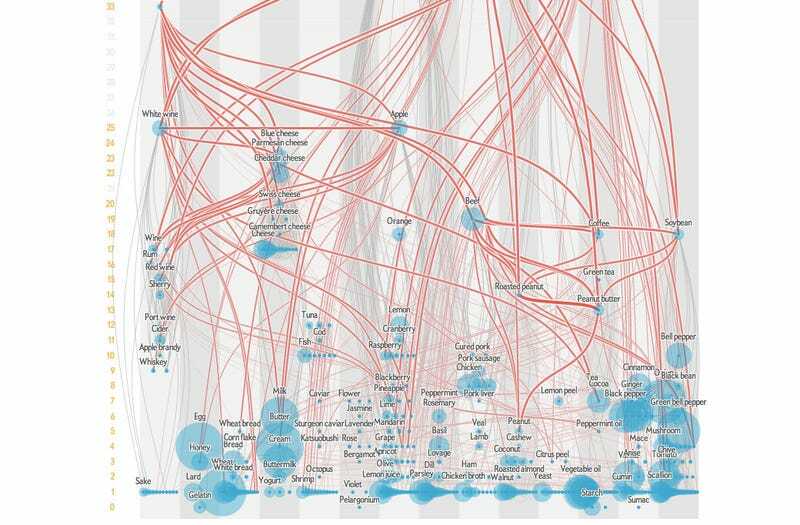 This amazing visualization from Scientific American shows how flavors are linked, and explains why certain combinations work so well. In the fully interactive visualization, each blue dot is a food which sits in one of 14 category columns—herb, meat, cereal, and so on. The size of the dot represents how common the food is, and lines link foods which share at least one flavor-related chemical compound. The thicker the line, the more shared compounds.